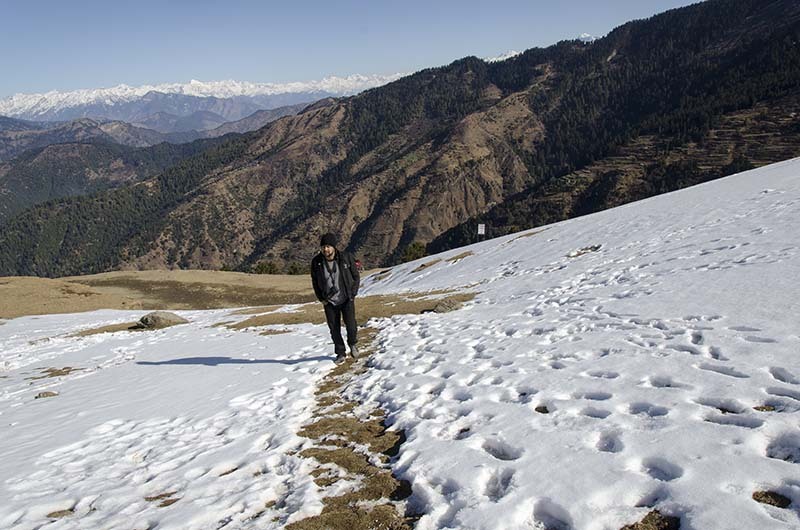 This article is in continuation with my previous post of Prashar Lake Travelogue. We reached Prashar Lake from Delhi on Day 1, then came to Sundernagar from the lake on Day 2 and returned to Delhi on Day 3. Please click on the link below to read previous part of this travelogue. As it usually happens with me on the trips, I was the first one to wake up. My other two companions were still asleep. I stepped out of our tent and oh what a beautiful morning it was. It was cold indeed but a pleasant kind of cold; with patches of snow covering the surrounding hills. Our host, the camp site owners, too were just getting up. I asked for a cup of tea and started to walk around clicking pictures. Camp site and our tiny tent. Kind of hard to believe that the three of us fit in to this little thing. Shoaib and Lavish too woke up in a few minutes. Not much happened after that. Our camp site owner served us some tea and started to prepare for breakfast while the three of us just strolled around clicking pictures to kill some time. Other guests too woke up but they all seemed to be in a bit of hurry, I am not really sure why. They all started to pack up and leave as if they had a train to catch. None of then waited to have breakfast or even bothered for a cup of tea. Can’t say that I mind it though. For the last one hour; we pretty much had the camp site all to ourselves; to have breakfast in peace. So far the plan was to arrive at Lake on Day 1, stay there on Day 2 and return to Delhi on Day 3. But after walking around leisurely for about an hour that morning, our itinerary started to change. We realized that there was really nothing to do here the entire day. 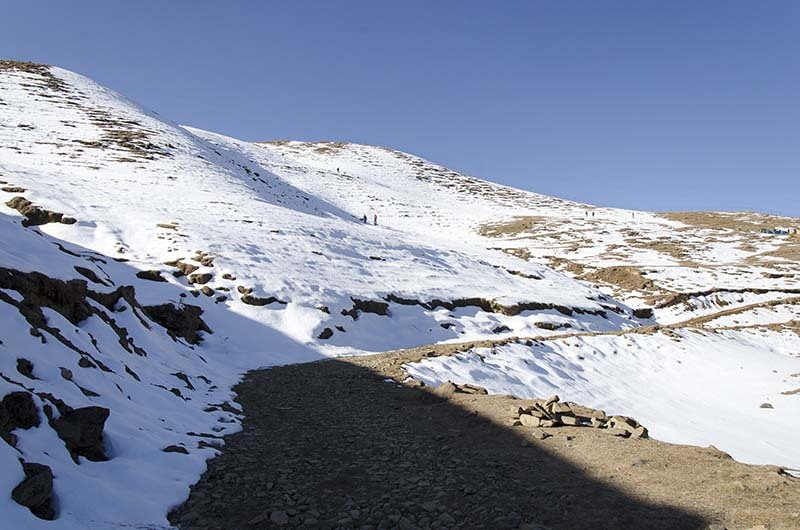 Prashar Lake is a good place to visit but camping for one night and spending a couple of hours at the lake will do it. There is really nothing else to do here and you don’t need to stay an entire day; especially when you are checked into a small tent. After a brief discussion, all 3 of us agreed that we should leave after having breakfast. Plan was then modified to go to Sundernagar for Day 2 and stay there for the night. 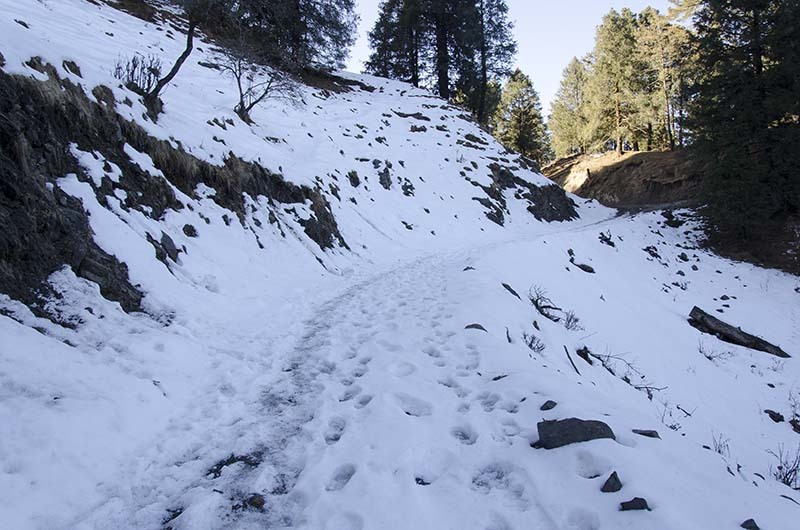 From Sundernagar, Shoaib and I will then leave for Delhi and Lavish would return to Mcleodganj. Soon breakfast was served in form of Aaloo Poori which was just about OK. There were only just the 3 of us and another group of 4 people left at the camp by then. We ate, made the payment to the camp site owner; and started walking back to the lake. The camp site was about 3 kilometers from the lake and it took us nearly 45 minutes to cover the distance. Next one hour was spend in just roaming around the lake, taking photographs and having some tea and Maggie at one of the tea stalls near the lake. The lake was completely barren of any snow and was not even that scenic at that moment actually. 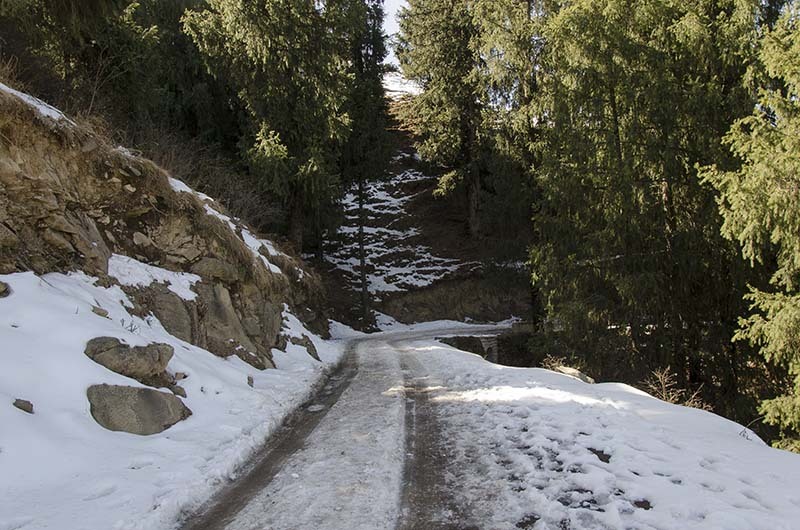 It looks good when there is greenery around; or when it is covered under snow snow. The sight that we got were kind of dull and I do not think I got even a single good image of the lake. Soon it was time to head back to the spot I left my Thar parked the other day. Lavish however had brought his bike all the way to the lake. Shoaib decided to ride the bike while Lavish and I started walking back. Somewhere along the way we realized that Lavish had forgotten his helmet back at the camp site. Now Shoaib had already went ahead of us taking the bike along; and since there was no reception, we could not even call him back. So in order to get the helmet back, we would then have to walk all the way back 3 kilometers to the camp site which neither of us was in mood to. So we forgot about the helmet and continued walking on. The idea of Lavish buying a new helmet at either Mandi or Mcleodganj sounded better at that time rather than having to walk back. I did not realize it the other day that we had left the car parked so away. It took us nearly one hour to walk back all the distance. Other modes of public transport like tempo travelers and shared taxis too were dropping the passengers at the same spot because of all the frozen snow. We met a lot of people walking from the other direction towards the lake. Some of them were quite eager to know how far the lake was; and I still remember the disappointed looks on their faces when I told them they will still need to walk for another hour or so. 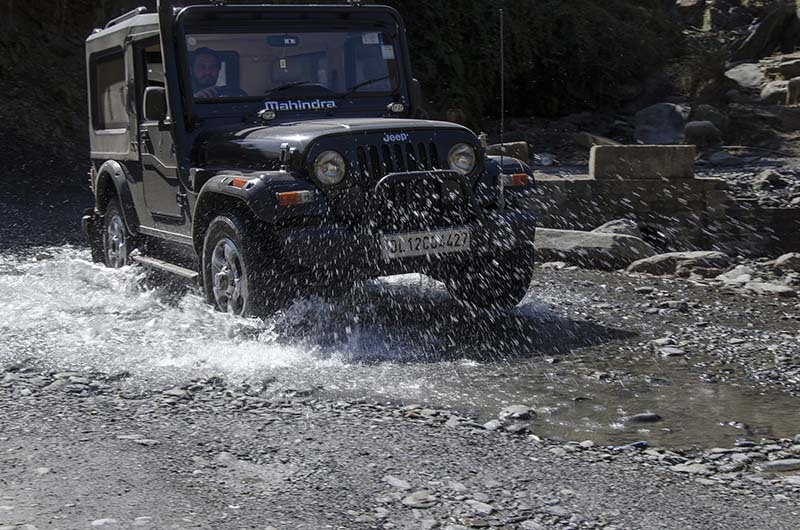 After what seemed like an eternity, we finally reached my Thar. Shoaib continued to ride ahead on bike Lavish and I followed behind. A couple of hours later we reached Mandi and a new problem came up. There was some sort of festival going on due to which there was a huge rush in the town. Traffic cops were posted all around, at every turn to keep the traffic under control. Now we had a bike but no helmet which meant that we will have to ride somehow escaping all the cops. Since Shoaib was riding the bike, the responsibility fell on his shoulders. Much to my own and Lavish’s surprise, Shoaib remained with us only for a few hundred meters while we were entering Mandi; and after that there was just no sign of him anywhere. We crossed Mandi and kept driving but there was no Shoaib anywhere. His phone too was with us in the car so there was no option of even calling him to find out where he was. After about half an hour, Lavish received a call from an unknown number. The caller turned out to be Shoaib calling from someone else’s phone. He told us where he was and we caught up with him a little later. So it happened that while we were crossing Mandi, a cop asked Shoaib for a lift which he readily gave. This really proved to be a blessing. For rest of the ride through Mandi, now a policeman was sitting with him on the motorcycle; and provided a safe passage through the town since neither Shoaib nor the cop had a helmet on. With a police inspector as pillion, Shoaib was not stopped anywhere at all. At around noon, we made it to Sundernagar and the cop remained with us all the way. After a bit of hotel hunting, we checked in Hotel Comfort Inn for the day. There wasn’t really anything too great about the hotel but it is a decent enough place to stay for a night. For a price of Rs. 2,200, they gave us two rooms with an adjoining door in between. After freshening up, we went out for lunch at a nearby restaurant as this hotel don’t have a kitchen of its own. We came back to the hotel at around 3 PM and this is where the story took a twist. Our idea of staying at Sundernagar was to sit and just chit chat. Lavish had moved back to Dehradoon a few years ago and it was a long time that the three of us were together again. So we wanted to talk and play catch up. Lavish and Shoaib switched on the TV but I was feeling a little tired and sleepy. 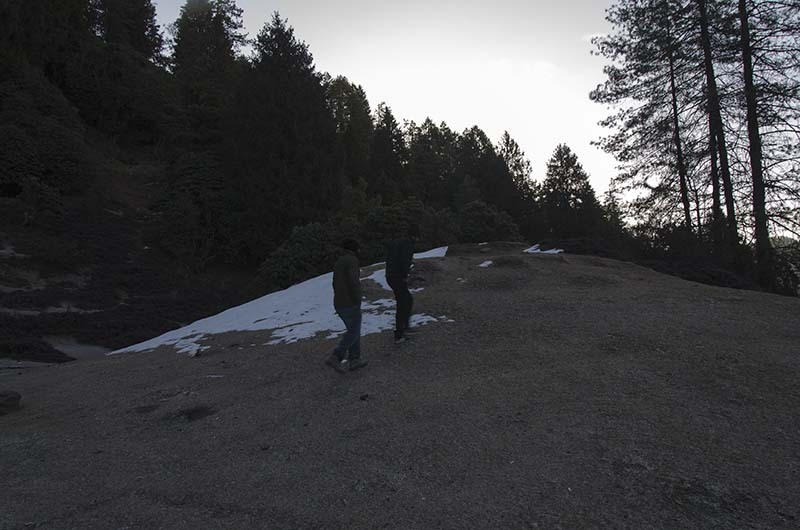 The night at Prashar Lake was not a comfortable one and we were all kind of exhausted a bit. So I decided to take a short nap and went to the second room with instructions to my friends to wake me up in an hour. I however woke up 9 hours later; at 12 midnight when my phone rang. I looked at the watch and was shocked to see that I had been sleeping for so long. I went into the adjoining room and found that the TV was still on but the guys who were supposed to wake me in an hour were themselves fast asleep. They both too woke up a little later than me. Fortunately for us, the door of the hotel was not locked at the night and we stepped out for a late night stroll in Sundernagar. We were all very hungry and luck favored us yet again. We found a Dhaba open and decided to have some dinner. By 3 AM we were back again at the hotel and thought to start the return journey because there was no point really in staying in Sundernagar any longer. Starting at 3 in the nights would at least have us enjoy the traffic around Chandigarh. So we packed up and it was time to end the trip. 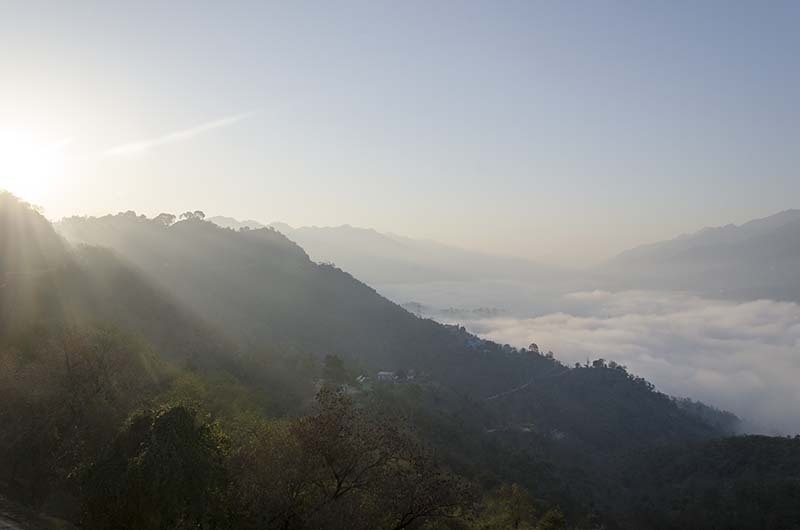 Lavish was to head back to Mcleodganj while Shoaib and I returned to Delhi. Caught this beautiful sunrise on the way. We reached back home in Delhi at around noon. Overall it was a great and fun trip. 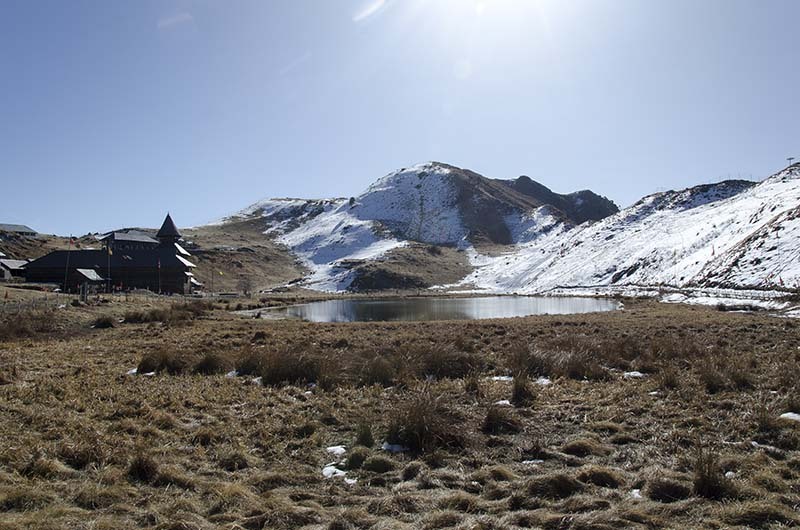 The lake was a bit dull but the surrounding area with patches of snow looked great. A trip to Prashar Lake can easily by done over a weekend and I will highly recommend it. If you have any questions or need any further information above planning your trip, then please feel free to ask in the comments section below; or at our Community Forum; and I will be glad to answer.